Glittens (also know as a glommits) have the warmth and comfort from mittens, and the dexterity and mobility from fingerless gloves. Wear them as mittens to keep your fingers snug, but convert then to gloves by flipping over the top and securing it with the button when you need to use your fingers. With step-by-step photos, this unconventional pattern shows you how to customize the gilttens for any hand size you desire. 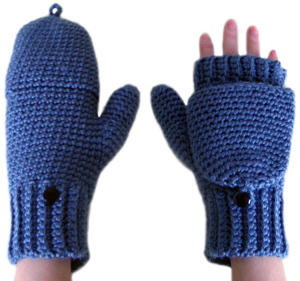 If you’re looking for just classic mittens, check out the Crochet Pattern: Easy Adjustable Mittens. This pattern can be made to fit any size from toddlers to adults. Instructions include guidelines for taking measurements, which are used in the place of conventional sizing guidelines, allow for the item to be customized for the intended hand size. Need help? If you need help while crocheting your glittens feel free to ask! This entry was posted on Monday, February 21st, 2011 at 12:15 AM by Rachel Choi	and is filed under Best Crochet Patterns. You can follow any responses to this entry through the RSS 2.0 feed. You can leave a response, or trackback from your own site. I just finished my first “glitten” that I started this morning. I’m really impressed with the quailty of the pattern and the amount of photos. As someone who doesn’t normally buy patterns, I have to admit that this one is completely worth it. Thanks for all the details you put into it! I’ve made a similar fingerless glove pattern, which turned out really nice. The only problem is that I feel like I’m wearing gauntlets because the pattern turned out so stiff. How flexible are these glittens at completion? When I put mine on, I’m able to make a fist with my hand comfortably. When you start crocheting and you think the fabric is too tight for you, you can use a different crochet hook and even a different weight of yarn if you prefer. Or you can add stitches to make the glitten roomier, since the pattern will show you how to adjust.